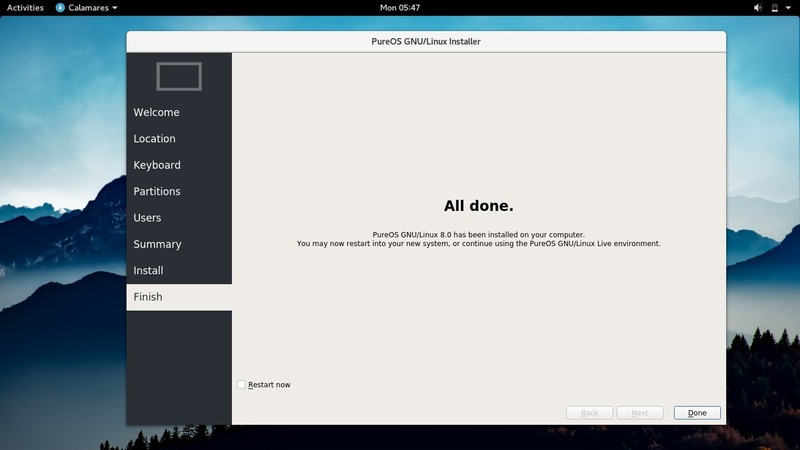 This tutorial explains installation steps for PureOS 8.0 GNU/Linux. PureOS is a fully free computer operating system based on Debian with modern desktop (GNOME 3.26) and latest software (rolling release). PureOS installation is very easy for beginners and it doesn't requires internet connection. The whole installation takes only 10 minutes and already includes all device drivers. 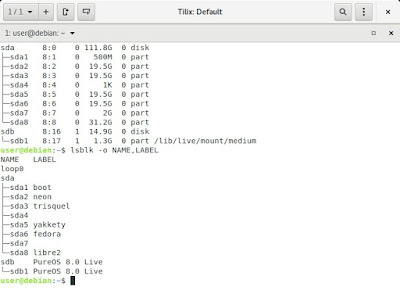 However, while you can perform this tutorial in singleboot and dualboot modes, it's best to install PureOS in a blank computer. Read each step carefully and happy installing! If PureOS is new to you, read PureOS GNU/Linux Quick Intro. You want a distro like Trisquel but with newer packages. You want 100% free distro, new, easy to install, easy to use, children and old people can operate it. You want very stable Debian Desktop with Calamares & rolling release. You can only install PureOS in a 64 bit computer. Unfortunately, PureOS doesn't support 32 bit for now. Prepare 2 blank partitions before installing. Create a bigger one (>=20GB) for main partition, and create a smaller one (>=1GB) for swap partition. I suggest you to shrink an unmounted Windows partition (if you use another OS), or, create ones from an unused partition (if you have one). You can do it with GParted program. As example, I use my /dev/sda6 (20GB) as my main partition, and /dev/sda7 (2GB) as my swap partition. Download PureOS and write it to your USB flash disk. Use GNOME Disk Utility at any GNU/Linux distro, or, use Rufus if you are at MS Windows. Create backup for your important data. Again, create backup, this is important. Boot your computer from USB to make PureOS running. Select "LiveCD" (not "Install") from the selections. 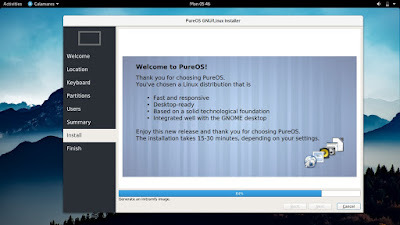 Once you enter PureOS desktop, press Win key, click "Install" button, and the PureOS Installer showing. First step: select language. This will be the language of whole interface of PureOS. Second step: select a region to determine your timezone and currency automatically. Third step: select a keyboard layout. Default selection is safe. Fourth step: select Manual Partitioning and press Next. I suggest you to never use another options unless you either (a) use a blank Hard Disk Drive, or (b) know exactly what you do. Fifth step: create your main partition. As example suggests, I determine my /dev/sda6 (20GB) as main partition. Click on the main partition (that you've prepared) > click Change button > a small dialog "Edit Existing Partition" (picture below) appears > select Format > select File System: ext4 > select Mount point / > don't select flag > OK.
Sixth step: create a swap partition. This doesn't need to be huge (1 or 2GB is enough), doesn't need to be 2xRAM anymore, but still necessary. As example suggests, I determine my /dev/sda7 (2GB) as my swap. 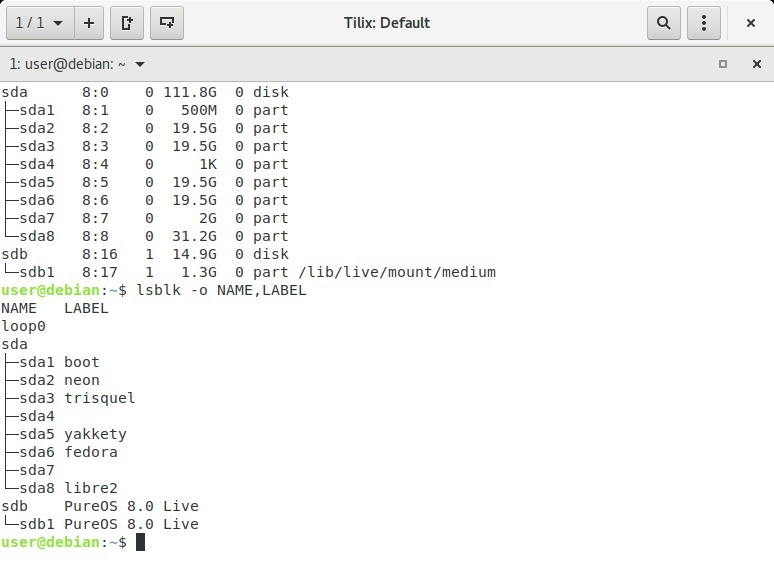 Select the second partition (the smaller one you have created) > click Change button > select Format > select File System: linuxswap > OK. Seventh step: select the location for bootloader to be installed. Bootloader is a small program placed at Hard Disk Drive, the disk where the main partition resides. For instance, if your main partition is /dev/sda6, then your Hard Disk is /dev/sda. If your partition is /dev/sdb9, then your Hard Disk is /dev/sdb. 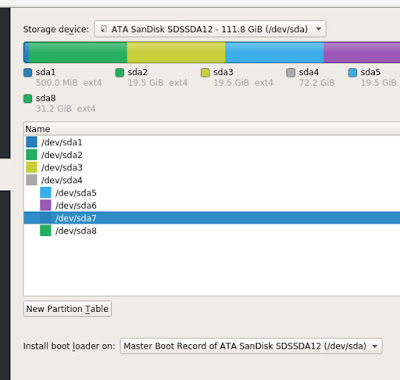 Based on my main partition being /dev/sda6, so, I select /dev/sda as my bootloader location. Eighth step: create your own username and password. This is your own user account on PureOS. Also, your password here will be the password of sudo command later. Ninth step: read carefully each of the summary and then start the actual installation. Make sure you've verified OK to all of your choices. If you press OK/Install Now here, then the actual partitioning starts, and you cannot revert back anymore. Tenth step: just wait. On an low-spec laptop (Aspire One 756, 4GB RAM, 120GB SSD) it takes no more than 10 minutes. If your computer is better, then it should be faster. Once finished, it says "All done." and you can just restart to use PureOS. Happy running!